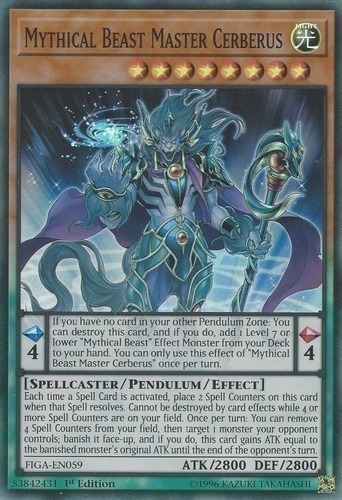 Pendulum Effect: If you have no card in your other Pendulum Zone: You can destroy this card, and if you do, add 1 Level 7 or lower "Mythical Beast" Effect Monster from your Deck to your hand. You can only use this effect of "Mythical Beast Master Cerberus" once per turn. Monster Effect: Each time a Spell Card is activated, place 2 Spell Counters on this card when that Spell resolves. Cannot be destroyed by card effects while 4 or more Spell Counters are on your field. Once per turn: You can remove 4 Spell Counters from your field, then target 1 monster your opponent controls; banish it face-up, and if you do, this card gains ATK equal to the banished monster's original ATK until the end of the opponent's turn.